BRUCEVILLE-EDDY, Texas — The TX 7 / FM 107 bridge which goes over I-35 in Bruceville-Eddy was scheduled to reopen after early-morning traffic Monday. According to the Waco District Texas Department of Public Safety, one lane will open in each direction to allow drivers to go straight or turn left. Right turns at either end of the bridge will not be allowed. TxDOT recommends for drivers traveling westbound on TX 7 going north on I-35 crossing the new bridge, to detour to the southbound frontage road, and u-turn at Old Blevins Road to the northbound frontage road. 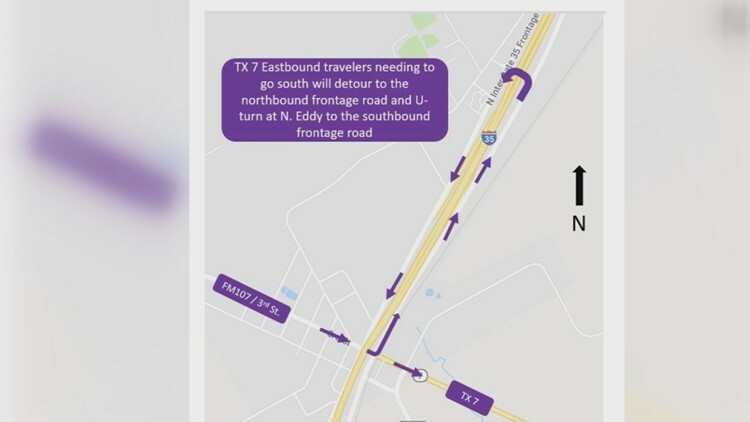 For those traveling eastbound on FM 107 going south on I-35, drivers will need to cross the new bridge, detour to the northbound frontage road, and u-turn at N. Eddy to the southbound frontage road. According to TxDOT, in order to construct the bridge railing, they will place concrete barriers on the sides of the bridge to protect construction workers and guide travelers across it. Due to the tight spacing, right turns from FM 107/TX 7 will not be allowed to either access road. These changes will remain in place for about four to six weeks until work on the bridge is complete. TxDOT reminds drivers that traffic fines double in an active work zone. RELATED: I-35 Investigation: Where have the workers gone? RELATED: I-35 Investigation: What's taking so long?